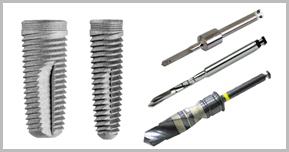 ITL Dental has been a supplier of OEM dental implant products since 1991. The Company has supplied products to a number of leading implant systems on a world-wide basis. Products are manufactured under a quality management system that complies with the requirements of ISO 13485: 2016. All products carry the CE mark and are FDA registered. Products are manufactured with high-quality materials and precise tolerances. ITL Dental is a registered FDA facility. Visit our Implant Catalog for more detailed information about implants, abutments and accessories, and instrumentation. Contact us to discuss your implant needs.